Autoplay Repair Wizard is a free utility from Microsoft that scans your computer devices to find defective AutoPlay settings, and attempts to fix those it finds. If you have problems with AutoPlay, such as AutoRun doesn’t run automatically when a CD or DVD is inserted, try to solve with Autoplay Repair Wizard, although there may be other factors such as policy and registry settings that may cause the issues. AutoPlay Repair Wizard can be downloaded from Microsoft Download Center (no longer available). Genuine Windows is required and users need to pass WGA validation check. Or users can download from the direct download link below. 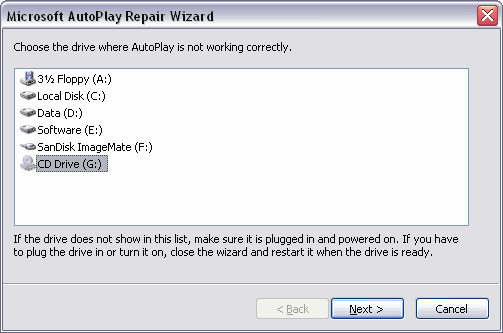 Note that Autoplay Repair Wizard only supports Windows XP or Windows 2003. For AutoPlay tool that supports Windows Vista, try CleanHandlers.